This study aimed to determine the cardiovascular responses during a prolonged exercise with voluntary hypoventilation (VH). 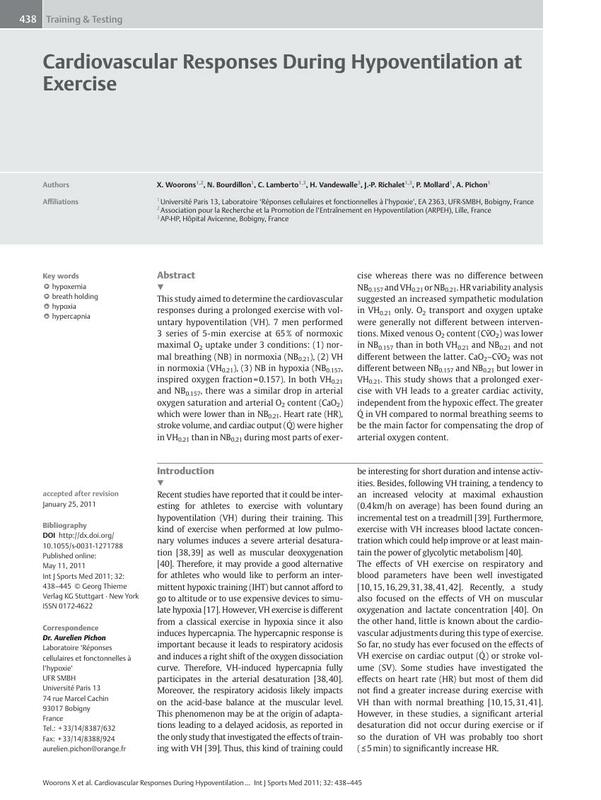 7 men performed 3 series of 5-min exercise at 65% of normoxic maximal O2 uptake under 3 conditions: (1) normal breathing (NB) in normoxia (NB0.21), (2) VH in normoxia (VH0.21), (3) NB in hypoxia (NB0.157, inspired oxygen fraction=0.157). In both VH0.21 and NB0.157, there was a similar drop in arterial oxygen saturation and arterial O2 content (CaO2) which were lower than in NB0.21. Heart rate (HR), stroke volume, and cardiac output (–) were higher in VH0.21 than in NB0.21 during most parts of exercise whereas there was no difference between NB0.157 and VH0.21 or NB0.21. HR variability analysis suggested an increased sympathetic modulation in VH0.21 only. O2 transport and oxygen uptake were generally not different between interventions. Mixed venous O2 content (C–O2) was lower in NB0.157 than in both VH0.21 and NB0.21 and not different between the latter. CaO2–C–O2 was not different between NB0.157 and NB0.21 but lower in VH0.21. This study shows that a prolonged exercise with VH leads to a greater cardiac activity, independent from the hypoxic effect. The greater – in VH compared to normal breathing seems to be the main factor for compensating the drop of arterial oxygen content.